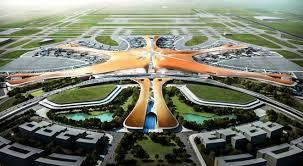 NDTV: The new Beijing airport will have five concourses spiraling out of the primary hall. Before the Beijing Olympics in 2008, the Chinese capital unveiled a new airport terminal that covered about 200 football fields in floor space, boasted a capacity of 50 million passengers a year, and cost $4 billion. That’s modest compared to what Beijing is opening next. Crews are putting the final touches on what will be one of the world’s largest and busiest airports. Designed by the late British architect Zaha Hadid, the phoenix-shaped Beijing Daxing International Airport is due to open in September as the latest major Chinese project even as the country’s economy cools. Officials say the $12 billion Daxing airport could one day serve more than 100 million passengers per year, approaching the traffic volumes of the busiest airport in the world, Hartsfield-Jackson International Airport in Atlanta. Rising out of farmland about 30 miles south of central Beijing, the new transport hub is a testament to the growth in civil aviation in China – which is expected to overtake the United States as the largest market in the early- or mid-2020s. – and the government’s vision to develop its industrial north through infrastructure investment.